I may be a willing buyer at 1216.50-1218.50 if we get a long trade set up in that zone +/- a point or two. Note that the market obliged by falling to and holding (thus far) at precisely that 1216.50 level. That doesn't mean that new lows do not lie directly ahead. But it does mean that I was given the opportunity to take a small risk for a relatively large potential gain. I've hypothozied that the overnight lows/highs are important for the next days' trading but only as the morning session is concerned. After that I tend to just look at the day session. What are your views or biases on my opinion, please? I'm looking to take 1/2 off at 1227.50 for a second 10 point trade. If filled, I'll leave my stop at 1215.75 on the second half. A good friend Elliot Waver just sent me this chart with his count and he also feels that the bottom may be in. Giddy Up! 1/2 left with a stop at 1215.75 for a 1.75 risk point risk on that 1/2. Worst case scenario for me today will be a 4.0625 point/contract profit average on all contracts traded. 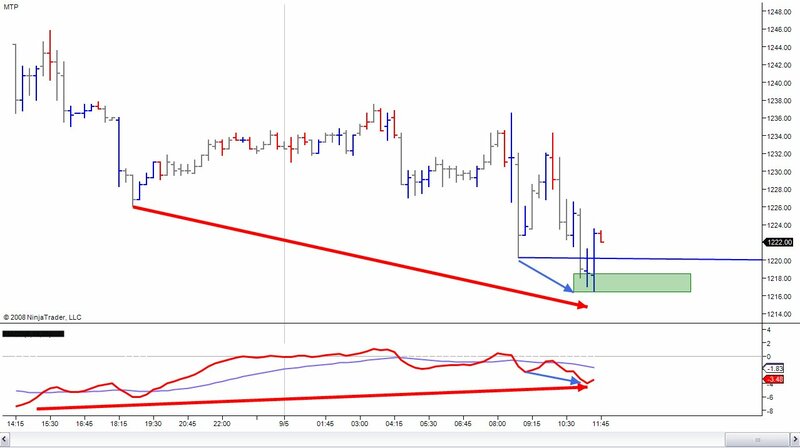 "I imagine, strictly speaking, yesterday was indeed one of those days during which a gap was not filled within the first 15 minutes of trading and yet failed to produce a close in the direction of the gap. Yesterday was a Short Sale day, and as such the plan would be to expect a rally to fail at, near, or slightly above a prior important high. We thus had a gap where price fulfilled the conditions for a TTT Short Sale and we had a trigger set-up. I visited Rich's TTT forum yesterday, and I read many many posts from TTT users (other than Rich), most all of which seem to miss the true character of the TTT method. 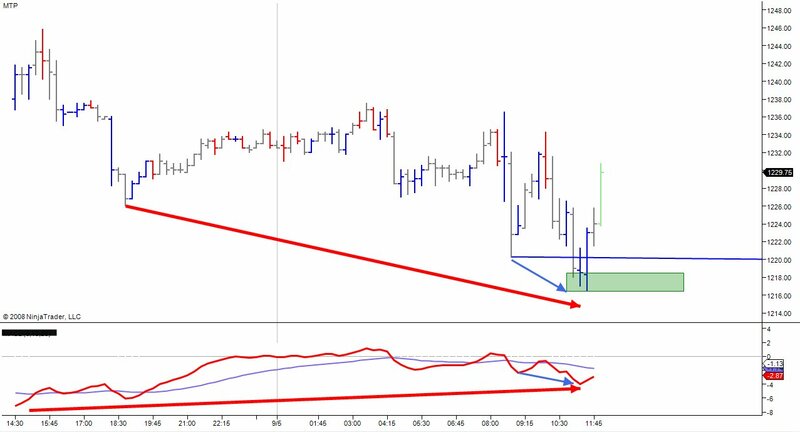 TTT provides the trader with an approach to gauging the odds of price action subsequent to encounters with recent support/resistance. TTT is not itself a "trigger" or a "set-up". The value of TTT (and this, to me, makes it invaluable) is that it tells the trader which set-ups to favor on a particular day. As one additional note to yesterday's action and the TVGR, if economic data is scheduled to be released post-open (typically at 10 AM EST or 10:30 EST) then the "real open" from which to start the gap-fill countdown is the release time, not the 9:30 opening bell. I Personally, I cannot imagine why anyone would not use...Rich's eBook to day trade the mini's, unless it is that one does not want to put in the time to study and learn...TTT inside out. Thanks for posting that. I tend to forget how to put all this together. I have always found that globex price extremes seem to retain their relevance until tested during regular session hours. I may be wrong, and I know traders who do very well never looking at overnight data. As for myself, I trade using two ES charts - a 15 minute Day Session only, and a 15 minute 24 hour chart. I do consult the 60 minute, daily, and weekly as well in order to orient myself toward the proverbial "Big Picture." I'm not saying I'm right, but just sharing what I have found works for me. It's all about what works best for YOU/ME! Thanks for all the little course corrections! 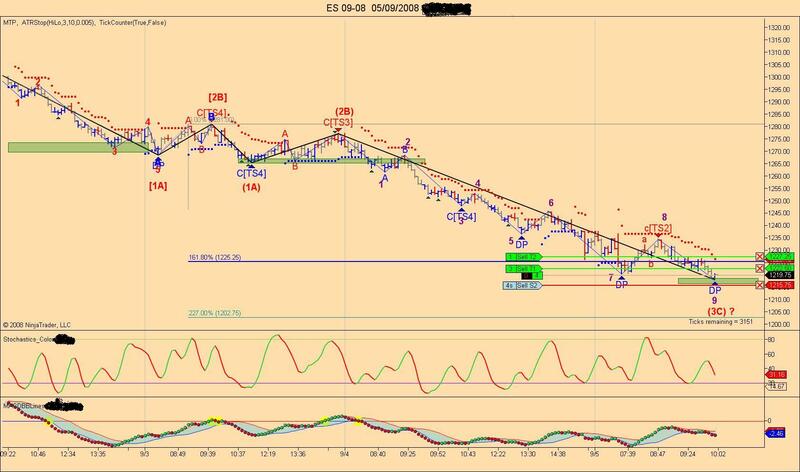 My count, such as it is, is nearly the same (though your friend is quite obviously a far more proficient EW analyst than I will ever be) - I've been waiting for a wave v of 3 of I to give us our wave 4 rally to achieve the TTT targets above. It looks like we're we are possibly getting a mini-bull flag or drift on the 15 minute ES. If we pop here then we will likey achieve 1238.50-1241 before any real selling pressure comes in, and if the ES manages to overcome resistance at 38.50-41, then we may very well get a strong rally to achive the TTT SS day expectations.